There are so many things to do when running a household. In order to keep track of everything, there are several checklists to use, and we’re here to help. 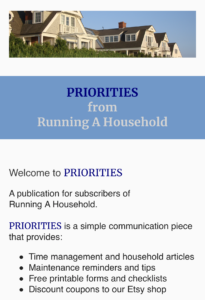 One of the most important lists to establish is your Household Chores Weekly Checklist. We have a few examples, or you can feel free to create your own. The first example is our favorite. 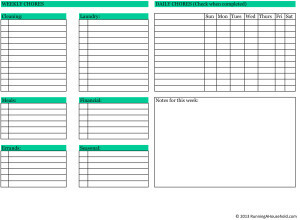 This pre-filled Household Chores Weekly Checklist lists all of the daily and weekly chores on one horizontal page. We also left some space for you to add your own chores. Just print, and start using. There’s also a blank version of the Household Chores Weekly Checklist. Feel free to print it and personalize it for yourself. 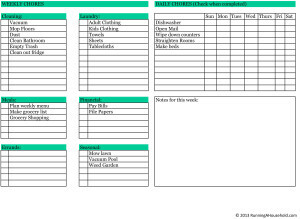 We have also included a completely blank Weekly Checklist by Day. 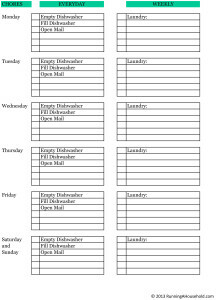 You can print and fill in your daily and weekly chores. Daily chores: There are various tasks we do on a daily basis. Some things are automatic, and always get done. (i.e. Make breakfast, feed the dogs, take a shower) These things are pretty basic, right? So they don’t make it on the list. Fill dishwasher; Empty Dishwasher: Since I started using this list, I’ve been able to keep the dishes under control. For some reason, putting a checkmark on the list is very motivating. Weekly chores: As for the weekly items, I chose items that I do on the same day of every week. For example, I put out the trash every Monday, and bring in the trash cans every Tuesday. I also opt to do a load of laundry each weekday. One for: adults, kids, towels, sheets, and tablecloths. 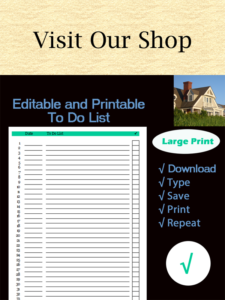 Personalize it for yourself, or print and use the pre-filled checklist. Give our checklist a try for one full week, and see how it works. Happy Planning! 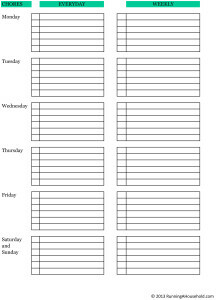 This entry was posted in Maintenance and tagged printable chores, weekly checklist house, weekly chores, weekly household checklist, weekly household chores on April 9, 2016 by Running A Household.